Da Capo Press, 9780306824616, 256pp. Susan Silverman grew up with parents who were, both before and after a devastating loss, atheists. Yet, as a young adult, she shocked everyone who knew her ("But you were elected Class Flirt in high school!") and became a rabbi. What was not surprising, however, was that she built her own big, unwieldy family through both birth and adoption, something she had intended from childhood. With three daughters and two sons ("We produce girls and import boys"), this unique family becomes a metaphor for the world's contradictions and complexities-a microcosm of the tragedy and joy, hope and despair, cruelty and compassion, predictability and absurdity of this world we all live in. A meditation on identity, faith, and belonging-one that's as funny as it is moving-Casting Lots will resonate with anyone who has struggled to find their place in the world and to understand the significance of that place. Susan Silverman is a writer, activist and speaker. She has written for and appeared in The Forward, The Boston Globe, The New York Times, The Daily Beast, The Huffington Post, The Jerusalem Post, The New York Post, Al Jazeera, and CNN, among others. She speaks on social justice issues, including partnering with her sister, comedian Sarah Silverman, to address issues and ideas of common concern, most recently at Lincoln Center as part of Tina Brown's "Women in the World" conference. She is the co-author, with her husband, of Jewish Family & Life. "Not many memoirs leave readers with the question 'How will I respond?' This one does...Anyone with a complicated, messy life and family-namely, all of us-will find a home in Silverman's story." 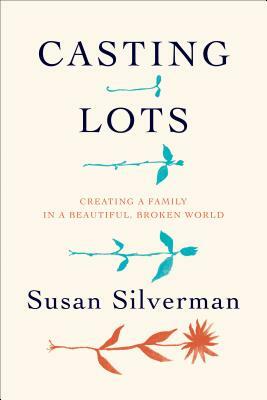 "Susan and her unique family is a microcosm of the hope and despair of the world we all live in. As funny as it is moving, this meditation on identity and faith will resonate with anyone trying to find their place in the world."